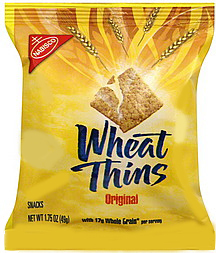 Wheat Thins in individual Snack Size packages. Order individually or in quantities of 60 for full cases. Nabisco Wheat Thins, we love them, and bet you do too! 1.75 oz Packages. Sold Individually, or order in quantities of 60 for full cases.